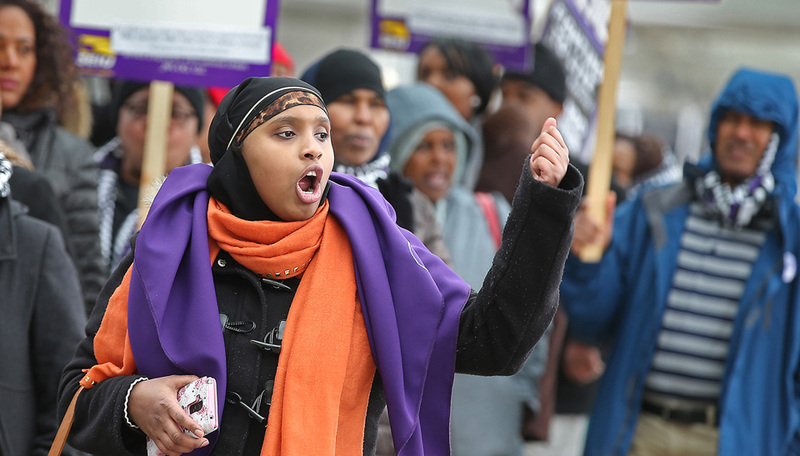 MINNEAPOLIS — In a significant win for low-wage workers nationwide, janitors at major department stores and groceries in the Twin Cities have voted to unionize. This is the first time that janitors throughout a major metro area have organized together. In several communities across the nation, low wage workers have successfully organized for a $15 minimum wage and paid safe and sick time. Now. workers who clean Target, Best Buy, Macy’s and other stores in the Twin Cities have gained union representation. The win comes after six years of rallies, lawsuits and strikes, and harassment by the managements. “We’re happy and we’re proud that we’ve changed the industry,” said Maricela Flores, a retail janitor who spent countless hours in recent years organizing through a Twin Cities-based worker center, Centro de Trabajadores Unidos en la Lucha/Center of Workers United in Struggle (CTUL). The workers, employed by subcontractors to clean major department and grocery stores, are largely immigrants and workers of color. Through two federal class action lawsuits, retail janitors recovered $1.1 million in unpaid wages and damages. Workers pressured contractors to raise wages by $2.50 an hour – the first raises in more than a decade of declining pay. In 2014, they convinced Target to adopt a Responsible Contractor Policy for the contracted cleaning of their stores. This year, Best Buy, Macy’s and other retail giants made the same commitment. Some 1,000 workers are employed in retail cleaning in the Twin Cities, CTUL said. More than 500 employed by four contractors—Carlson Building Maintenance, Prestige Maintenance USA, IFS and Leones—are now represented by the union. Organizing will continue among other workers, but will be made easier by the standards set by the unionized janitorial workforces at Target, Best Buy, Macy’s, Cub Foods, Lunds & Byerly’s and Whole Foods. From its inception, the movement to organize retail has been worker-led. Retail cleaners such as Flores – the mother of five – and Pascual Tapia Vega – a janitor at Target – went store-by-store to mobilize co-workers. “We fought in the cold. We fought in the rain,” said Tapia Vega. “What motivates me to fight is when I sit at the dinner table and look at the faces of my kids,” said Flores.